On occasion, we like to discuss really high level marketing stuff. Why? Because it’s fascinating, and also helps you learn more about the details behind our texting service. With that said, have you ever heard the phrase, cost per acquisition? It might not sound too familiar, but you potentially may know it by the abbreviation, CPA. Now, to keep it basic, a text marketing cost per acquisition is how much it costs to acquire one subscriber. Now, consider this. A subscriber can potentially offer you a lifetime of value. So, look at it this way. Let’s say you own a burger joint. In exchange for opt in, you give away one free burger. Now, the cost of the your acquisition, or this subscriber. factors out as follows. Let’s say your costs of goods, or cost of the burger is $3.25. Keep in mind, that’s your cost, not what you actually charge. 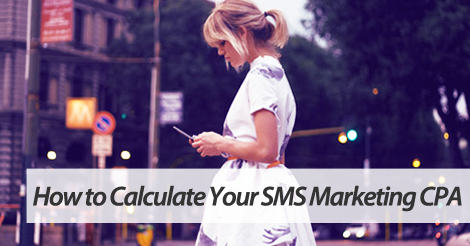 Now, let’s say it costs you, on average, 7 cents per text message sent. Now, adding those two figures together, you just spent $3.32 to acquire that one subscriber. Now, this is also assuming that every single subscriber will redeem your opt in offer, which isn’t always the case. On top of that, sure your CPA might hover around $3 and some change, but this is a connection you’ll have for months, even years to come. What they will give back to you in return will way exceed the original CPA. Now, do not confuse your CPA with ROI (return on investment). Although very similar, your ROI is more of a continuing statistic, while CPA applies to the first time your subscriber opts in, and how much that costs. Partner up with Slicktext.com, a top texting service. Give us a ring at 1.800.688.6290 to learn more, or head over to our pricing page and sign up for a free plan. We empower our customers with top of the line resources that help every single user succeed.